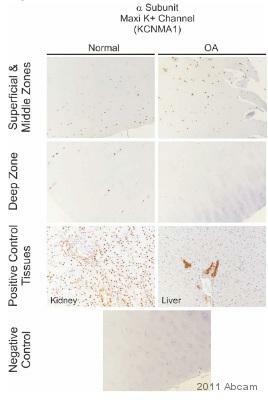 Detects Maxi K+ alpha from Human tissues as well as recombinant Human protein. Synthetic peptide corresponding to Human Maxi Potassium channel alpha/SLO aa 945-961. Potassium channels are a group of ubiquitously expressed proteins that serve numerous functions in excitable and non-excitable cells. One class of integral membrane potassium channels is the large conductance, calcium-activated potassium channel (Maxi K+). Maxi K+ differs from most other potassium channels in that its activation is controlled by both increases in intracellular calcium and by membrane depolarization. Maxi K+ dual activation is possible because of its structure. The core of the channel, which is similar to other potassium channels, is a Maxi K+ alpha homotetramer that contains both a voltage sensor and an intracellular calcium binding domain. In vascular smooth muscle, an auxiliary beta-subunit is found in a 1:1 stoichiometry. The beta-subunit exhibits its effect on the Maxi K+ channel by effectively decreasing by 5- to 10- fold the concentration of calcium required to keep the pore open. Our Abpromise guarantee covers the use of ab3586 in the following tested applications. WB Use a concentration of 2 µg/ml. Can be blocked with Maxi Potassium channel alpha/SLO peptide (ab5022). Widely expressed. Except in myocytes, it is almost ubiquitously expressed. Belongs to the potassium channel family. Calcium-activated (TC 1.A.1.3) subfamily. KCa1.1/KCNMA1 sub-subfamily. Contains 1 RCK N-terminal domain. The S0 segment is essential for the modulation by the accessory beta subunits KCNMB1, KCNMB2, KCNMB3 and KCNMB4. The S4 segment, which is characterized by a series of positively charged amino acids at every third position, is part of the voltage-sensor. The pore-forming domain (also referred as P region) is imbedded into the membrane, and forms the selectivity filter of the pore. It contains the signature sequence of potassium channels that displays selectivity to potassium. The RCK N-terminal domain mediates the homotetramerization, thereby promoting the assembly of monomers into functional potassium channel. It includes binding sites for Ca(2+) and Mg(2+). The calcium bowl constitutes one of the Ca(2+) sensors and probably acts as a Ca(2+)-binding site. There are however other Ca(2+) sensors regions required for activation of the channel. The heme-binding motif mediates inhibition of channel activation by heme. Carbon monoxide-bound heme leads to increased channel activation. Phosphorylated (Probable). Phosphorylation by kinases such as PKA and/or PKG. In smooth muscles, phosphorylation affects its activity. Palmitoylation by ZDHHC22 and ZDHHC23 within the intracellular linker between the S0 and S1 transmembrane domains regulates localization to the plasma membrane. Depalmitoylated by LYPLA1 and LYPLAL1, leading to retard exit from the trans-Golgi network. Publishing research using ab3586? Please let us know so that we can cite the reference in this datasheet.